Psychologists have already identified a multitude of factors – besides actually how hungry we are – that influence the amount we choose to eat, from the size of the portion, to the company we're dining with. To this list, we can now add the weight of our waiter or waitress. According to new field research in the journal Environment and Behaviour, when people are served by an overweight person, they are more likely to order desert, and they tend to consume more alcoholic drinks. The finding lends an irony to the discriminatory hiring practices of many dining establishments. Putting aside that it's simply wrong to discriminate against people based on their size, what these bars and restaurants have failed to realise is that by hiring exclusively skinny waiting staff, it's likely they're actually encouraging their customers to order less food and drink. With the help of a team of observers, the researchers Tim Döring and Brian Wansink recorded hundreds of interactions between diners and waiting staff in 50 restaurants, mainly in the US but with a few in France and Spain. The key finding was that diners were substantially more likely to order desert if they were served by a larger waiter or waitress (with a BMI of 25 or above), as compared with a more slender server (with a BMI less than 25) – specifically, 16 per cent of diners with a larger server ordered desert compared with 7 per cent of diners with a slender server. With a bigger waiter or waitress, diners also consumed more alcoholic drinks. These effects applied the same regardless of the diner's own body size. A great strength of this study is that it was conducted in the noisy, unpredictable world of real restaurants and based on the observation of real diners. This comes with a cost, though, in terms of lack of experimental control. 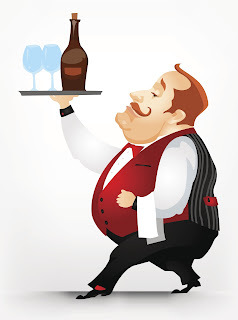 For example, perhaps there was something else about the larger waiters and waitresses, besides their size, that was influencing the diners to order more (we do know that gender was not an issue – a similar mix of waiters and waitresses were categorised as large and slender). Why do people order more food from a larger waiter or waitress? Again, because of the observational nature of the study, the researchers are mostly left to speculate – they think it might have to do with a kind of licensing effect where the larger server gives the feeling that it is more acceptable to consume more. Given the increasingly large fraction of our food that we consume outside of the home, and given the obesity crisis in Western nations, Döring and Wansink say their finding is hugely important in terms of identifying the factors that contribute to over-eating. So, how to avoid the indulging effect of a large waiter or waitress (and all the other factors that subconsciously influence you to eat more in a restaurant)? The researchers suggest a simple rule of thumb – decide roughly what and how much you plan to eat before you get there.